Many of you know that Pete and I recently welcomed baby William into or lives. If so, I'm sure you can appreciate that our enthusiasm for cooking waned a little in the weeks following. 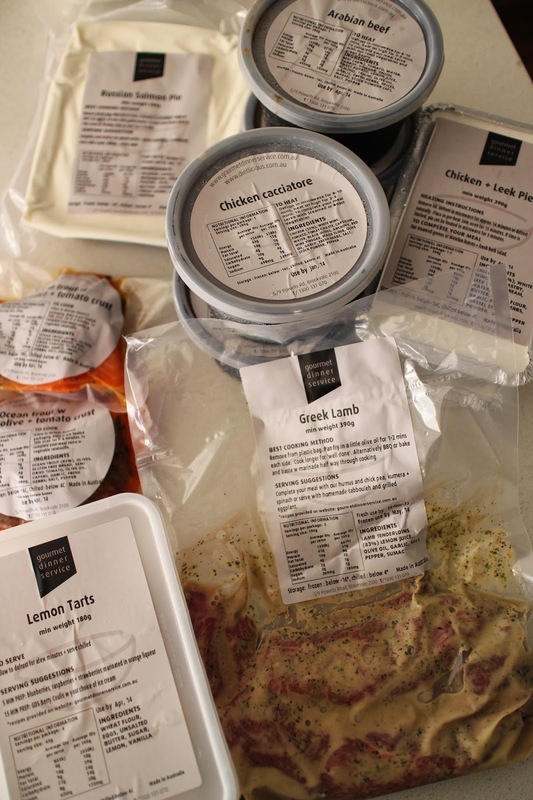 Enter Gourmet Dinner Service (GDS)- A Sydney based food company who offer a wide range of home-delivered gourmet meals and hampers. Pete and I chose to preview the GDS New Parents Hamper* ( $147.90) which is intended for new parents' first week at home - The hamper provides 5 main meals. * We also sampled the Olive Trout w/ Olive & Tomato Crust. To complete each meal you simply add a salad, rice or vegetables of your choice. These can also be purchased if you don't feel like preparing them yourself. Sides inlcude options like brocoli with garlic oil, salads, brown rice, lemon and herb quinoa and French style cannellini beans. The hamper arrived in an insulated Styrofoam box with ice bricks and included a range of fresh and frozen meals with cooking instructions, ingredient list, nutritional panel, storage instructions and use by date clearly marked on each item. Every meal was fresh and tasted delicious, however the two standouts were the Russian Salmon Pie and Greek Lamb Fillets. 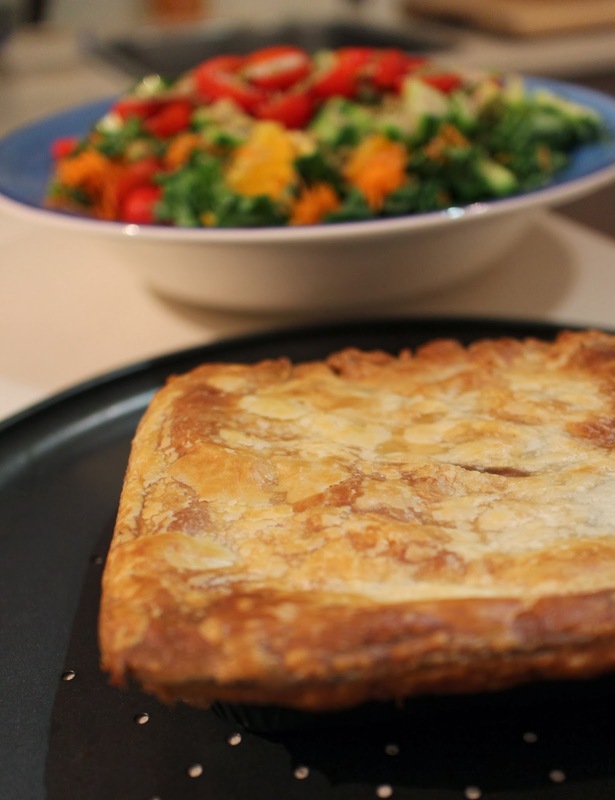 With subtle flavours of salmon, dill, mushrooms and rice the pie was topped with a flaky buttery pastry. We served it with a fresh salad on our first night home and it was divine. On that first night we also enjoyed a lemon tart each for dessert. A nice buttery pastry filled with tangy lemon curd drizzled with dark chocolate. The perfect pick-me-up. The next evening, we pan fried the Greek lamb fillets which were marinated in olive oil, lemon juice, garlic, oregano and sumac and served them with another easy to make salad. The fillets were full of flavour, juicy and incredibly tender - A must order. Over the course of the next few days, Pete and I enjoyed the remaining meals and were really impressed with the flavours and ease of preparation involved. Having nutritious tasty meals ready to go enabled us to focus on more important things like catching up on sleep and adjusting to the demands of being first time parents. I can't recommend these guys more highly. A must-have for anyone who is busy and wants delicious easy to prepare meals at home. We will definitely be ordering from them again. 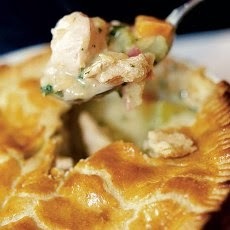 Chicken & Leek Pie - filled with large chunks of tender chicken meat & leeks in a cream, white wine, garlic and dill sauce topped with a butter puff pastry - Photo Source GDS. 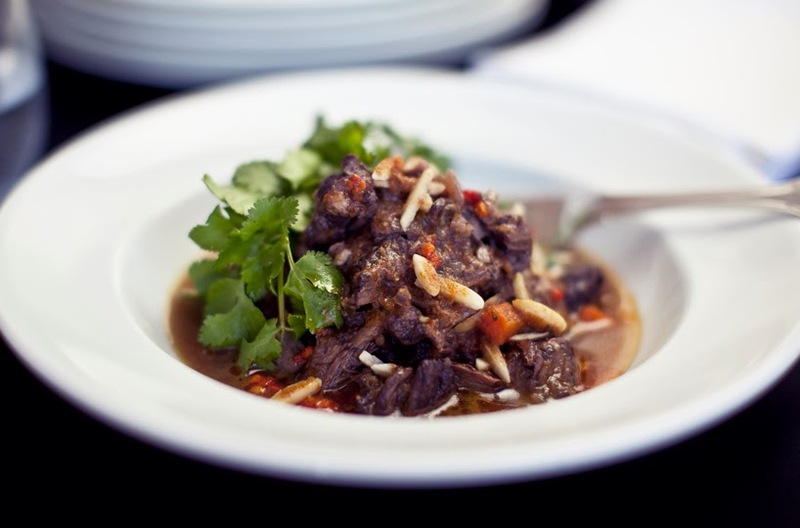 Gourmet Dinner Service offer a large range of meals, festive entertaining menus, cocktail party food and hampers and are available in Sydney, Melbourne, Brisbane & Canberra. They also offer meals for those on specific diets including gluten free, vegetarian, dairy free, low carb, diabetic, low fat and low GI options. All meals have been reviewed by a nutritionist and have been endorsed by a dietician and are preservative and additive free with all produce sourced locally. Check out their website below.